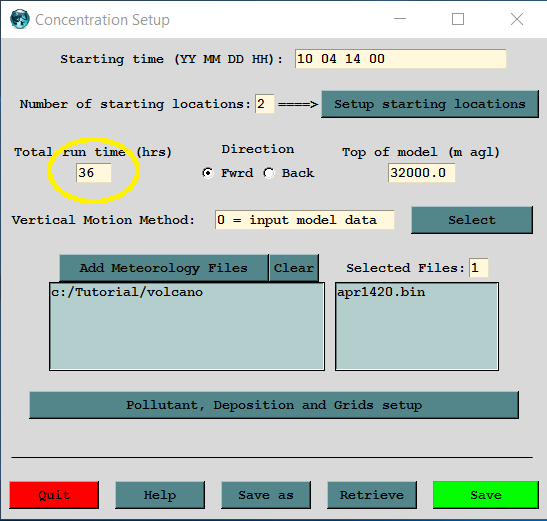 In this example we will rerun the three-stage Eyjafjallajokull eruption from the earlier example as one simulation but this time using an emissions input file called EMITIMES to define the time and height varying emissions. Before starting press Reset and delete any PAR???? files in the working directory that were created in the previous sections. 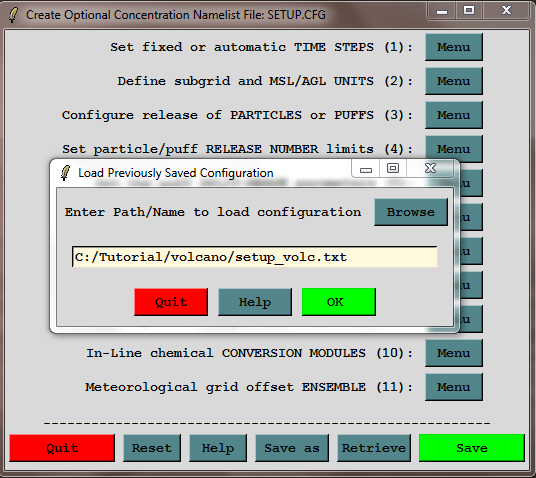 As before, start by retrieving the example control_volc.txt control file from the \Tutorial\volcano directory. We will review the changes required to use the EMITIMES file rather than the CONTROL to define the emissions. Open the concentration run setup menu and change the run duration from 12 to 36 hours. Now open the pollutant menu and change the emission rate and duration to 0.0 for each. Repeat this change for all four pollutant species (particle sizes). 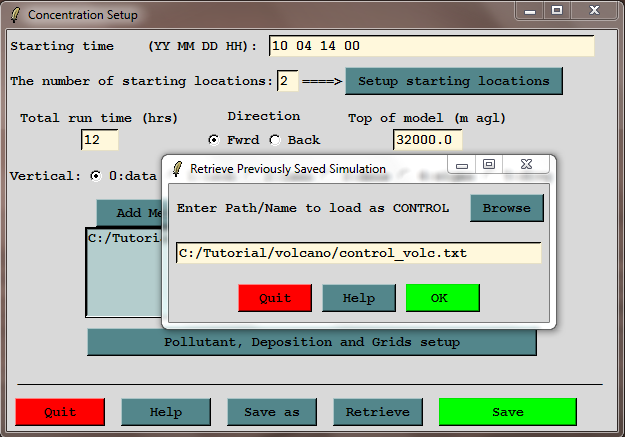 Although this step is not required because the values in the EMITIMES file will replace the emissions defined in the CONTROL file, if the emission file is not properly configured and those values are not used, there will be no emissions and the simulation will clearly fail. Save to close the setup run menu and open the Advanced / Concentration / Configuration menu and retrieve the setup_volc.txt file. 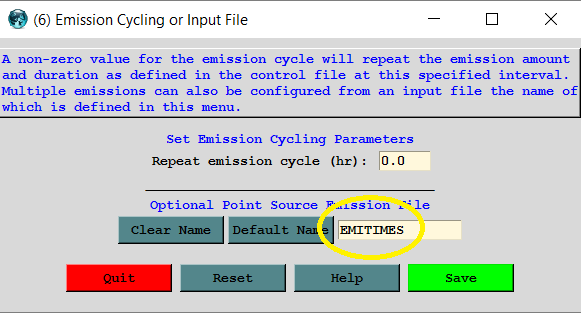 Open menu (6) that defines the emission cycling or input file and press the Default Name button to set the character string to EMITIMES. Naturally any user defined file name can be used in this field. 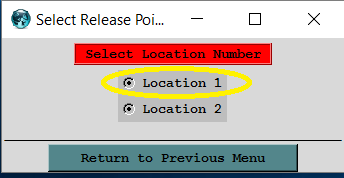 Next open the Advanced / File Edit / Emissions file menu and press the Configure Locations button. The two locations represent the two release heights used to define the vertical line source. Click on each location to edit and change the release duration from 2400 to 1200 (12 hours) for both the 100 m and 6000 m release heights. The emission rate will be changed in a later step. Press Save in each menu, then Return to Previous Menu when finished editing, and then Save to File to exit the emissions file GUI. 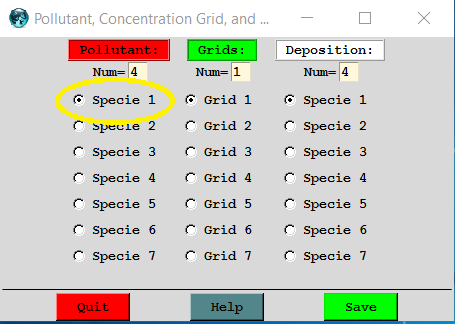 The emissions file menu in the GUI can only be used to define the emissions for one time period. 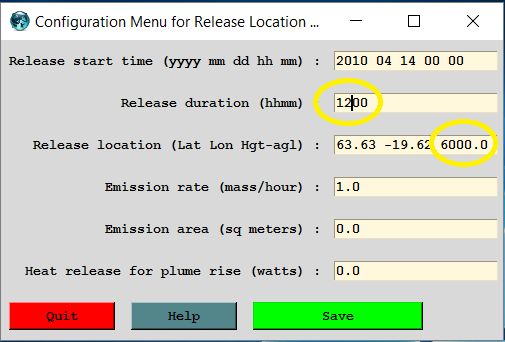 This 36 h simulation will consist of three 12 h emission periods. Emissions after the first time period can only be defined by manually editing the EMITIMES file. Go the the \hysplit\working directory an open EMITIMES in notepad. Note there are eight lines, the first four representing the four particle sizes released at 100 m and the last four the same particle sizes released at 6000 m. The order is the same as defined in the CONTROL file. 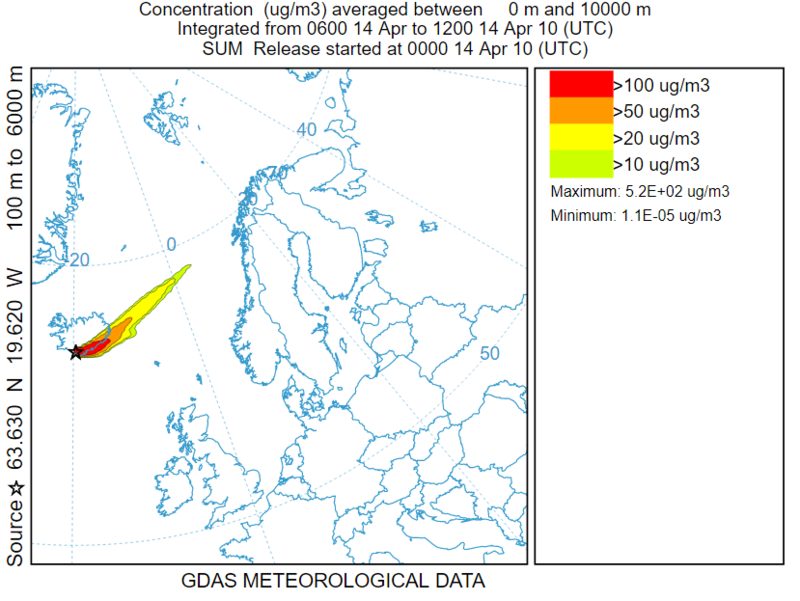 The outside loop is the number of release locations, the inside loop is the number of pollutants (particle sizes in this case). 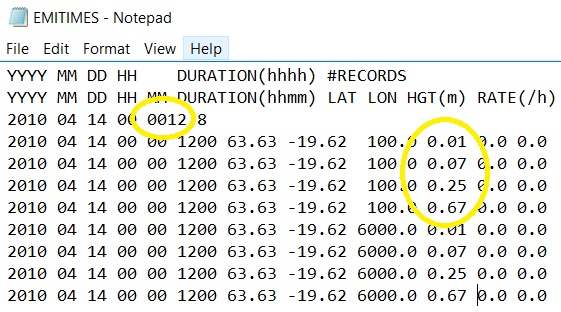 On the first time group header record, change the 9999 to 0012 to represent the time duration of this first group of emission records. In the second edit, define the emission rate for each particle size from largest to smallest as 0.01, 0.07, 0.25, 0.67 to represent the fraction of the total mass represented by each size particle. Instead of fractions, we could enter the fractional percentage of the total mass (1.0E+16) as was done in the example using the CONTROL file. The actual emissions will be entered in a later step. 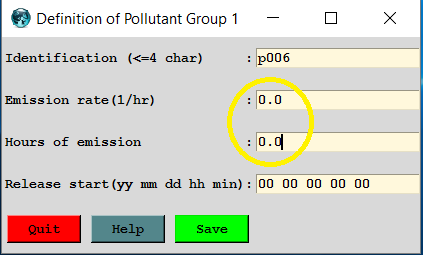 In the last edit, copy the first time group emissions twice, to create two new time groups, representing emissions starting at 14 12 and 15 00. 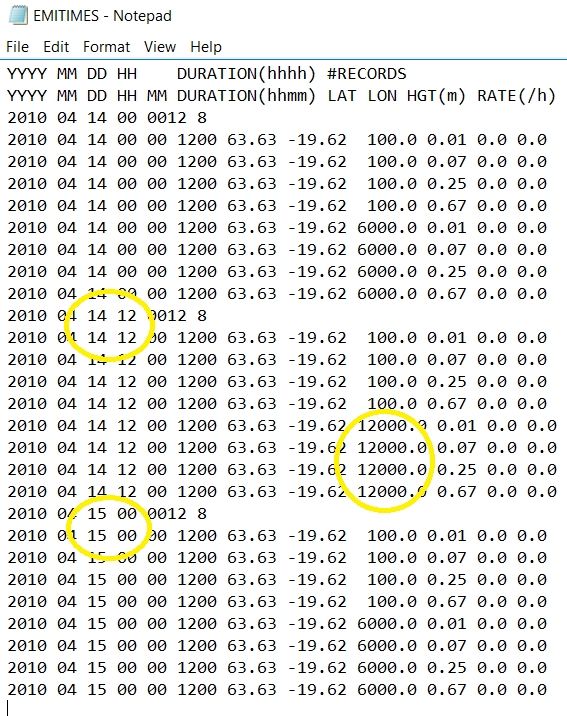 Change the dates for all the data records to match the two new emission time groups and also change the upper level emission height from 6000 to 12000 for the 14 12 emission period. Save the changes. 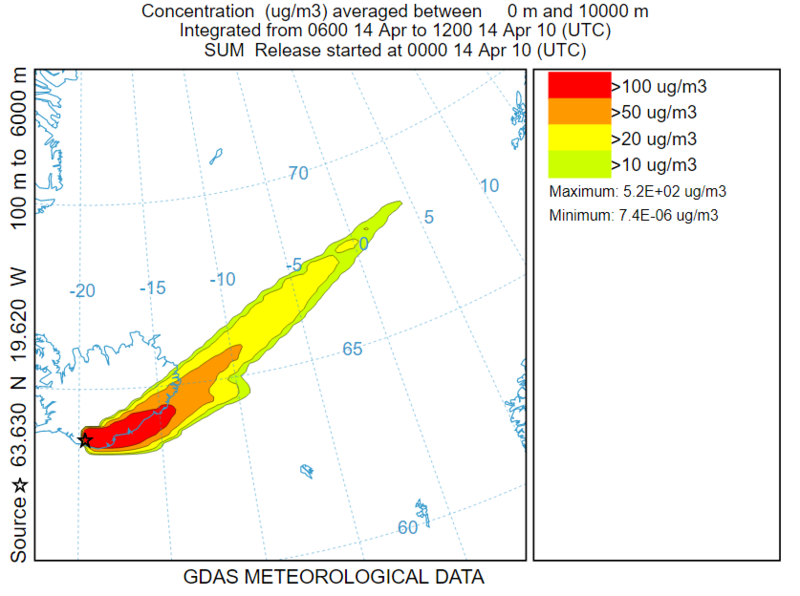 The EMITIMES file now matches the 36 emission scenario from the previous volcanic ash simulation. Reopen the GUI and run HYSPLIT. To complete the exercise, open the concentration display menu and as before check the All radio-button, fix the contour intervals (100+50+20+10), units of ug, and the most important step, define the concentration and deposition multiplier of 1.0E+16 which will then result in a graphical output almost identical to the previous simulation. 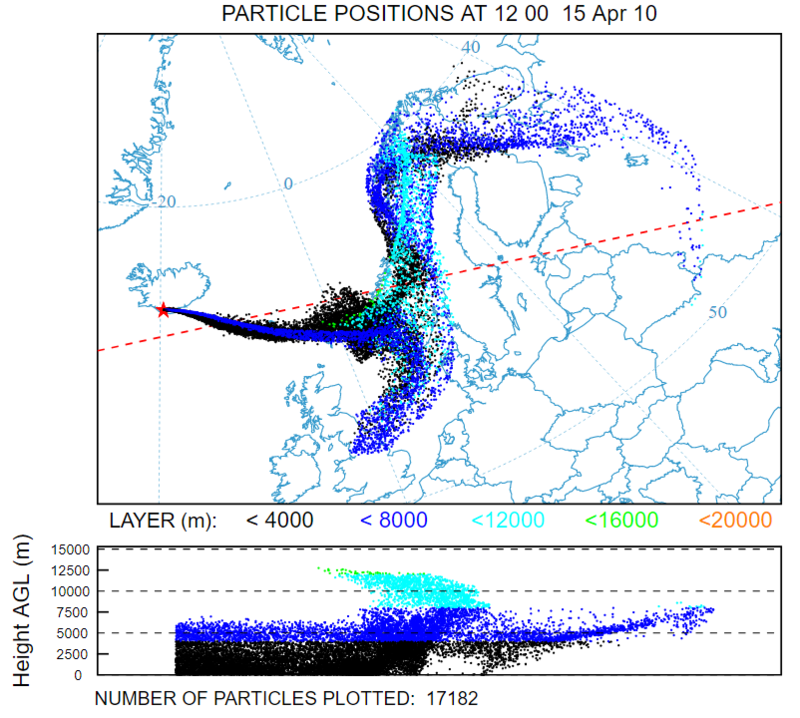 The temporal height variation can also be confirmed by examining the particle position plot. 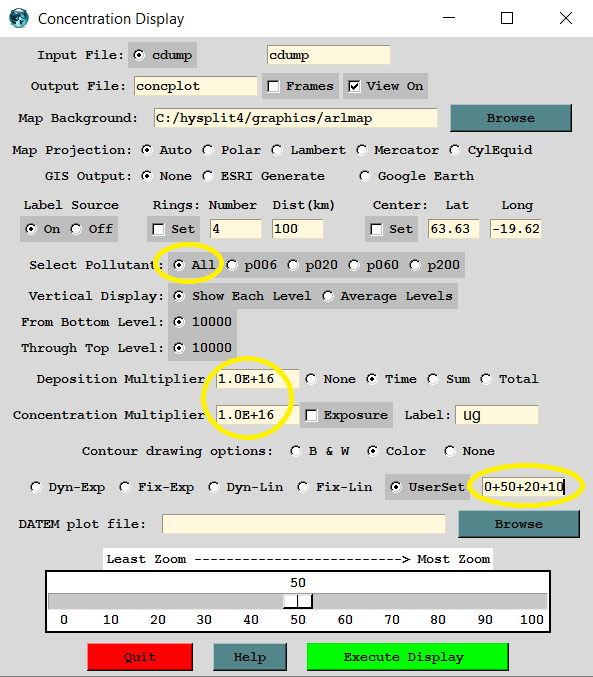 This section illustrates how the GUI, in conjunction with some simple manual editing procedures, can be used to define a complex emissions scenario using the EMITIMES input file.